The Dow fell, with Travelers <TRV.N> down 1.9 percent. Hurricane Florence is expected to be an extremely dangerous major hurricane through Thursday, the National Hurricane Center warned of the Category 4 storm bearing down on the U.S. east coast. UnitedHealth shares <UNH.N> also weighed on the Dow. The stock fell 3.2 percent after a Citigroup downgrade. Apple <AAPL.O> shares dropped 1.3 percent, weighing on the three major indexes. But the S&P 500 and Nasdaq rebounded from losses last week. 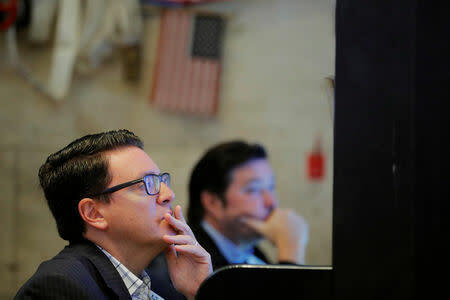 The Dow Jones Industrial Average <.DJI> fell 59.47 points, or 0.23 percent, to 25,857.07, the S&P 500 <.SPX> gained 5.45 points, or 0.19 percent, to 2,877.13 and the Nasdaq Composite <.IXIC> added 21.62 points, or 0.27 percent, to 7,924.16. Shares of United Rentals <URI.N> rose 5.0 percent after the company said it was buying privately held equipment rental firm BlueLine Rental. Among other gainers, Nike <NKE.N> rose 2.2 percent after a report said the footwear maker's Labor Day sales rose, easing concerns about the hit to demand after the Colin Kaepernick advertisement. Tesla <TSLA.O> gained 8.5 percent after brokerages Baird and Bernstein said the electric carmaker was on track to be profitable and cash-flow positive in the second half of the year. Alibaba <BABA.N> dropped 3.7 percent after the company said Jack Ma will step down as chairman in one year, passing on the reins to trusted lieutenant Chief Executive Officer Daniel Zhang.